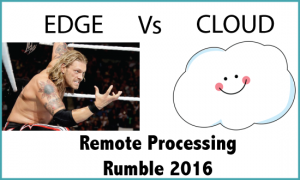 Edge Computing vs Cloud – You may have heard the term Edge Computing start to be thrown around last year, you might have even heard someone use the term FOG computing (and if you were anything like me your head immediately hit the desk). Edge computing is the concept of putting the intelligence, processing and decision making power into the device sitting at the edge of the network. Typically, modems/remote devices can be seen as ‘dumb’, they simply collate data from various sensors and send it back to a central server or more recently to a cloud environment for processing and decision making. Edge computing wants to change this by empowering the device to make decisions as soon as the data is received. Reducing the latency and ‘time to act’ significantly benefits autonomous or critical applications like the increasing swarms of drones and unmanned safety units being developed for agriculture and emergency applications like forest fires. The other benefit to processing on the edge is that it theoretically reduces the amount of data sent back over a wireless network, a device might alert someone that it is taking an action or has completed an action rather than sending a request to act, waiting for a response, then acting. The debate is still in its early days with proponents on both sides arguing the benefits and drawbacks, but I have a feeling we’ll see a lot more coverage of edge computing in 2016. LPWAN on the rise – 2015 saw Low Power Wide Area Networks (LPWAN) firmly insert themselves into the IoT networking conversation. 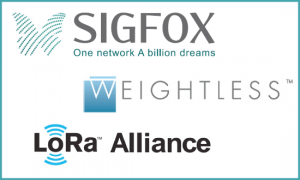 Last year France’s SIGFOX secured over $100 million in funding and announced expansion plans in the USA & Australia arguably putting themselves at the forefront of the LPWAN movement, but the LoRA Alliance & Weightless SIG are also poised to make a disruptive splash in Low Power Communications. Australia has it’s very own Sigfox deployer Thinxtra who will be rolling out pilot sites soon. Telstra are also looking at LPWAN with a pilot in Melbourne CBD and we expect a number of LoRA alliance deployers to be hot on their heels. Expect more conversation and visibility of LPWAN networks in 2016 but there is still a fair amount of consolidation & brand building to be done before we reach peak LPWAN penetration. Cellular Flux – Expect the 2G/3G/4G debate to continue to rage on in 2016 with AT&T and Telstra both poised to hit the button at the end of the year with Optus and all of Singapore’s cellular providers aiming to do the same in early 2017. More networks announce their 2G shutdown dates – As alternative technologies become more affordable and solution providers in some parts of the world are inevitably forced to make the change, I can see more operators feeling comfortable with pulling their 2G networks. LTE leapfrogging – With a strong established base of 2G hardware in Europe I can see some operators taking the Telenor approach and shutting down 3G prior to 2G in a long term effort to consolidate everything under LTE (Read about Telenor’s 3G 2020 shutdown here) It’s a smart approach as it buys more time for operators who are still rolling out LTE base stations and fine tuning coverage and it allows their customers to continue planning and designing boards without being forced into a 3G device that may not last as long as they hope. Opportunistic 2G grabs – We’ve already seen M2M/IoT MVNOs making any deal they can to squeeze more life out of 2G in the USA with Vodafone still not announcing in Australia I’m wondering if we won’t see the same here. There is even talk of some independent operators/MVNOs buying old hardware and spectrum to keep 2G alive for M2M. It’s a short term gain for a decent outlay but with Asia and Europe still churning out cheap 2G hardware it may pay off. In the hardware space 2016 there is still some juggling of frequency bands to get the right products for multiple markets together. Most customers we work with are waiting patiently for hardware compatible with Band 28 (700Mhz) which will offer the greatest LTE coverage on Telstra’s 4GX network the successor to their Next-G 3G offering. 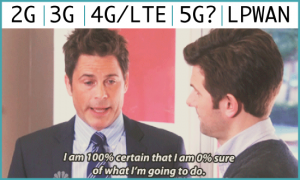 With Telstra’s 2G shutdown looming we’ve already seen customers in Australia testing heavily with LTE in the hopes of getting everything ready to bypass 3G entirely. Satellite – 2015 was a relatively quiet year for M2M/IoT over satellite, expect this to change in 2016. Iridium will be launching their first run of satellites for their Iridium Next constellation partnering with US space exploration heartthrobs SpaceX and Russian organization Kosmotras. With SpaceX delivering a very successful launch for Orbcomm last year, Matt Desch and the Iridium team should be feeling positive. 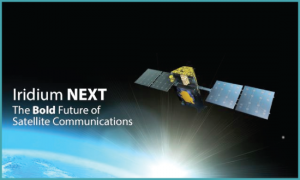 While Next isn’t scheduled to be fully operational until 2017 the increased noise and conversation around Iridium is sure to spark renewed interest in M2M/IoT applications using satellite, especially those with global implications. As cellular operators continue to struggle with global roaming arrangements, pricing and interconnects we are seeing lots of customers with low bandwidth global solutions opt for the satellite route. With services like Iridium’s SBD and Inmarsat/Skywave’s IDP, companies who want a solution that will work out of the box anywhere in the world without having to deal with roaming contracts, excess usage and coverage issues are finding more and more uses for satellite as the cost for hardware and airtime comes down. 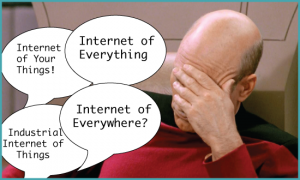 Terminology – With several major organizations already making steps to remove M2M from their corporate lexicon and replace it with IoT could we have finally settled on a term for this nebulous new technology? The writing has been on the wall for M2M for some time now, the term is already seen by most as an “insider term” only really used by those in the industry and not something that needs to be on customer facing marketing. To the customer this connected world and everything in it is IoT. Sure some of the major players will still try and make my palm connect with my forehead by rolling out IoE, IoYT & IIoT but now we’re starting to see job titles incorporating IoT, I think we are fairly safe to say we’ve decided on a term. Maybe I should be filing this one under hope rather than prediction, but could 2016 finally be the year we stop with all the pointless acronyms and corporate marketing terms and just call things what they are? In the solutions space I’ve already started to see a move away from using “smart”, “e-“ & the dreaded “i” prefixes for products. Does anyone really use the term smart-phone anymore? It’s just a phone, they’re all smart by definition now. Likewise we’ll start to see IoT products go from being Smart Thermostats, to just being thermostats as the technology becomes commonplace. And there you have it – My 5 predictions for M2M/IoT in 2016! Do you think these are more likely than my 2015 predictions? I’d love to hear what you think, Let us know on Twitter @M2MOneAU, on LinkedIn at M2M One or visit our website at www.m2mone.com.au.